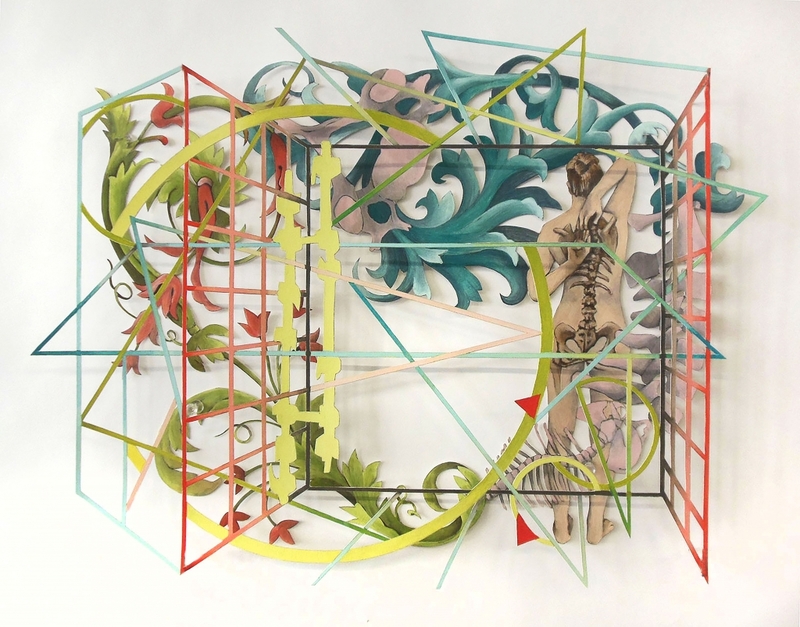 Erin Juliana’s paper cuts and small-scale paintings include images of the figure, filigree, architecture, geometric patterns, and medical diagrams. These images are derived from her own history of spinal deformity and her fascination with the symmetrical elements of decorative art. Her paintings and paper cuts express the tension between the organic and geometric that exists in her body, and present a feminist critique of what is considered abject pertaining to the female figure. About the artist: Erin Juliana is originally from Bucks County, Pennsylvania. She attended Maryland Institute College of Art for both her B.F.A. and Masters in Arts and Teaching. After moving to Brooklyn, New York, Erin received an M.F.A. in drawing and painting from Brooklyn College CUNY. Her work explores themes of deformity and correction in a variety of media including embroidery, appliqué, gouache paintings, and paper cuts. Erin currently lives in Brooklyn, works as an educator, and maintains a studio practice at Industry City Studios. Her work has been exhibited at the 440 Gallery, National Art Education Headquarters, and with the Wanted Design and Industry City Market.